If the ticket office is closed, please go to the next station (Hôtel de Ville). This stop used to be a beach where rich and poor came to wash, stark naked. Pressure from offended neighbours led to the opening of the first baths in 1680 and bathing in the river was forbidden. The quay became a trade port in the eighteenth century and warehouses with magnificent vaulted cellars were built. The wine warehouse competed with the one at Bercy. Business dwindled when the railways took the lead from river transport and the building was demolished in the early 1960s to make room for the Science Faculty (Jussieu). Much earlier Louis XIII's herbalists made the area a garden for their studies and the Natural History Museum began to take shape. A mosque was built at the beginning of the twentieth century and the amazing Institut du Monde Arabe at the end. 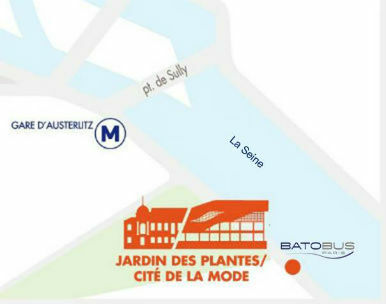 The Cité de la mode et du design (also known as "les Docks") was built in 1907 as industrial warehousing for the Ports de Paris. It is a city within the city dedicated to creativity: design, fashion, innovation and events. 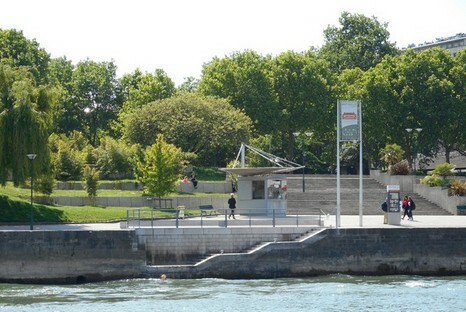 The Cité has permanent residents which include restaurants, nightclubs, a museum and shops.